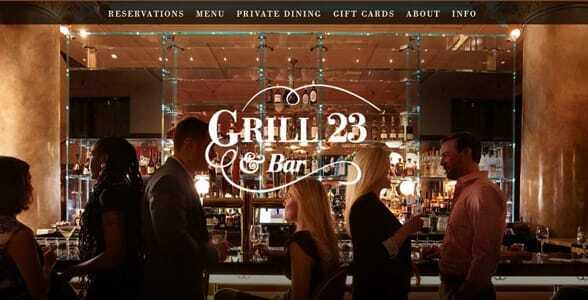 The Short Version: Grill 23 & Bar is a choice date spot for couples desiring a memorable evening in Boston, Massachusetts. The high-end steakhouse offers diners an intimate and luxurious atmosphere paired with excellent table service and large cuts of all-natural steaks. Couples can cherish those special moments together over a bottle of wine handpicked by a Master Sommelier and then indulge in delicious dishes prepared to perfection by the award-winning culinary team. Whether you’re proposing to a significant other or celebrating your wedding anniversary, you can sweep your partner off his or her feet by making a reservation at Grill 23. Between work, chores, and other responsibilities, you may not have time to go out with your significant other all the time, but it’s fun to treat yourself to a romantic meal every once in awhile. An upscale restaurant can be the perfect place to relax and reconnect with that special someone. You can let go of your stress and live in the moment while enjoying a three-course dinner. 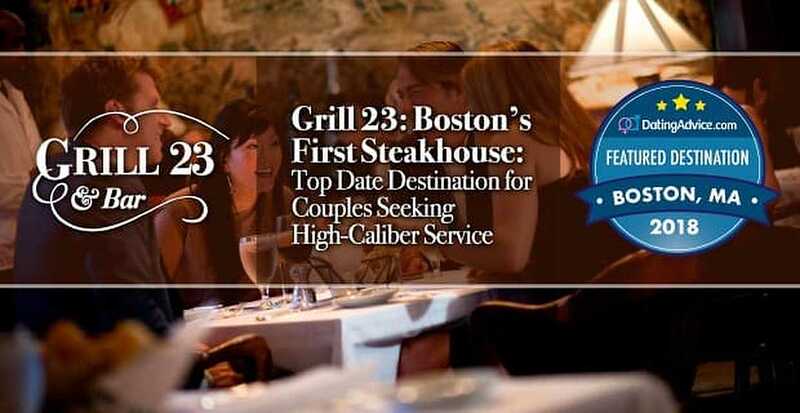 The moment couples step inside Grill 23, a classic steakhouse in Boston, they know they’re in for a special experience. The high ceilings, white tablecloths, and friendly servers put guests at ease by giving them some well-deserved VIP treatment. The grand dining areas on the first and second floors help couples get into a romantic mood while they dine at an intimate table for two. Grill 23 & Bar, a classic steakhouse in Boston, is open for dinner seven days a week. At Grill 23, you can enjoy a glass of wine or a signature cocktail while the savory smells of juicy steaks, fresh seafood, and steaming vegetables tempt your taste buds. The dinner menu has something for everyone, including soups, salads, seafood, chicken, and, of course, all-natural beef. Some of these dishes, like the Shellfish Sampler or the Coconut Cake, are perfect for sharing with a date. Grill 23’s simple yet classic menu offers an array of culinary triumphs that keep people coming back for more year after year. When Grill 23 opened its doors in 1983, it was the first and only classic steakhouse in Boston. Ken Himmel, the restaurant’s owner, wanted to offer Bostonians a superior dining option where they could enjoy excellent service and choice steaks. 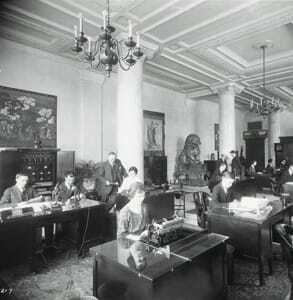 The Himmel Hospitality Group refurbished the resplendent rooms of the Salada Tea Building into Grill 23’s dining rooms. The Himmel Hospitality Group chose the old Salada Tea Building to house this new restaurant. This grand space, with towering columns and high ceilings, continually impresses Grill 23’s guests and creates an atmosphere of luxury and refinement. Today, Grill 23 sources its beef from the Brandt Family Farm in Southern California. The Brandt family raises vegetarian-fed, hormone-free, and antibiotic-free beef using sustainable and humane farming practices. This beef producer is the only one in the country to earn the Master Chefs’ Institute Seal of Excellence, and Grill 23 is proud to get its steaks from such a trusted source. The Grill 23 team endeavors to be transparent about where its food comes from, so guests know they’re getting an unparalleled dining experience. Only the highest quality steaks will do for this high-end steakhouse. Grill 23 prides itself on having knowledgeable and friendly staff members who help guests have the high-quality experience they’re looking for. Susan said the servers are always happy to take requests and do whatever they can to cater to the guest’s preferences. If you and your date want a seat by the fireplace or a specially prepared meal, let the staff know, and they’ll do their best to accommodate you. 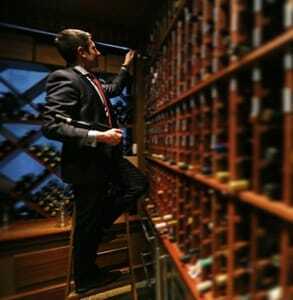 Grill 23’s top wine expert, Brahm Callahan, is one of only two Master Sommeliers in Massachusetts. The servers can even offer prime recommendations to diners. Some servers have been with Grill 23 for 20 years, so they know all the ins and outs of fine dining. Grill 23’s culinary team frequently goes over items on the menu and quizzes staff members on the best pairings or sauces to go with specific dishes. Grill 23 also conducts wine education courses that are open to any member of the team. Grill 23 always has a few sommeliers on hand during the evening to help diners navigate the restaurant’s extensive wine list. If you’re looking to order a bottle for the table, you can ask one of these experts which vintage will go well with your meal. The steakhouse’s wine cellar has over 2,100 wines to choose from, so you can easily find something to suit your palate as well as your budget. In 2017, Wine Spectator awarded Grill 23’s team its highly coveted Grand Award, a distinction that only 89 restaurants in the world have earned. Grill 23 provides a tasteful and indulgent backdrop for diners of all ages and backgrounds. People come from all over the city — and all over the country — to enjoy the steakhouse’s high-end food. Some guests have been coming to Grill 23 for years to celebrate their birthdays, graduations, weddings, and anniversaries. Some guests are only in town for a short while, but make a point to visit a local restaurant known for serving superior steaks. Whether you’re a local or a tourist, Grill 23 gives you the chance to treat yourself to something special. Grill 23’s staff can make your anniversaries and other celebrations extra special with a tasty chocolate message. “Oh man. This is up there with the best steak dinners I’ve ever had,” Robin G. raved in a five-star review on Yelp. She came to Grill 23 to celebrate her first wedding anniversary and said she was blown away. 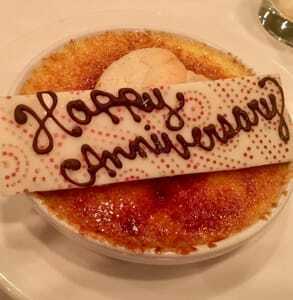 The couple sat upstairs by the fireplace and enjoyed an intimate three-course meal, starting with shrimp cocktails and ending with crème brûlée, which had “Happy Anniversary” written on it in chocolate. The Grill 23 staff is proud to provide such a memorable dining experience for families and couples celebrating some of life’s major milestones. Whether you’re hoping to seal the deal on a business trip or persuade your date to say “Yes” to a marriage proposal, you can set yourself up for success by heading to a high-end steakhouse known for its high-quality service. “Few steakhouses have fed us for as long or as flawlessly as Grill 23,” the Boston Magazine wrote in a review. From start to finish, Grill 23 serves up delicious dishes and memorable moments. The upscale steakhouse is a favorite among couples because of its grand decorations, high-caliber service, and indulgent cuisine. If you’re hankering for a prime ribeye or a shellfish platter, you can satisfy your taste buds at Grill 23 and savor a superior dining experience with someone special.